A massive, Romanesque style Metropolitan Street Railway car barn once commanded the corner behind you across O Street, with repair shops across Fourth Street. They dated from the 1880s, and were part of Washington's first street railway system. Streetcars were a lifeline for this neighborhood, long known as "the island" because it was cut off from the rest of Washington by creeks, a canal, the Mall, and eventually railroads and freeways. "We had our own community here," recalled Southwester Clarence "Chick" Jackson, "but we could also go anywhere off the island on the streetcar. It was our ... connection to the city." to Seventh Street, then back. The electric trolleys of the late 1880s came next, but they were replaced with buses in 1962. That year most car barns became unnecessary. O. Roy Chalk, who owned D.C. Transit (which became Metrobus in 1973), tore down his car barns to build the apartment houses Riverside Condominium and Channel Square. Cars of the Metropolitan Street Railway spent the night at this Romanesque style car barn that once stood behind your right. On a quiet Sunday in 1951, tidy townhouses stretched ahead of you on a tree-lined Fourth Street. When this photo was taken on Maryland Avenue in 1890, horse-drawn streetcars were rapidly disappearing. This 1880 map shows the city's horse-drawn street railways, including the line that ran through Southwest on Seventh and Fourth Streets passing this spot. D.C. Transit streetcars parked next to the car barn, 1961. The Downtowner minibus cars ran from F Street, NW to Southwest's Waterside Mall, 1976. The Chalk House apartments (now Riverside Condominium) are near completion in the foreground of this 1965 view. nation's first experiment in urban renewal. The 17 signs of River Farms to Urban Towers: Southwest Heritage Trail lead you through the Modernist buildings erected in the 1960s while marking the sites and stories - and the few remaining structures - of the neighborhood that was. Follow this trail to discover the area's first colonial settlers and the waves of immigrants drawn to jobs on the waterfront or in nearby federal government offices. Here Chesapeake Bay watermen sold oysters and fish off their boats. The once-gritty streets were childhood homes to singer Marvin Gaye and movie star Al Jolson. Later residents included Senator Hubert H. Humphrey and other legislators. 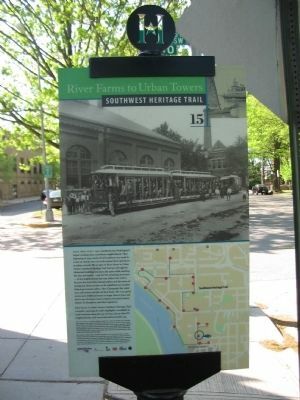 River Farms to Urban Towers: Southwest Heritage Trail, a booklet capturing the trail's highlights, is available at local businesses along the way. 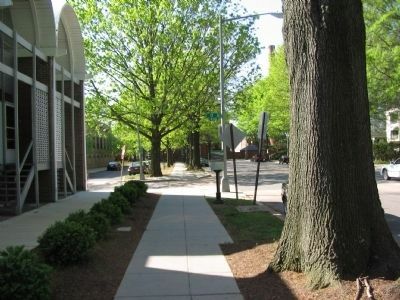 To learn about other DC neighborhoods, visit www.CulturalTourismDC.org. Marker series. 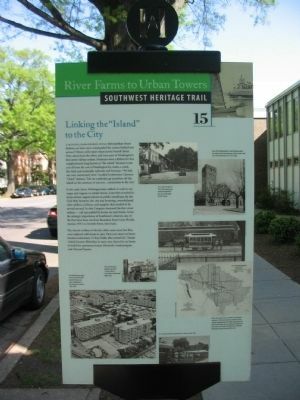 This marker is included in the Southwest Heritage Trail marker series. Location. 38° 52.384′ N, 77° 1.046′ W. Marker is in Southwest, District of Columbia, in Washington. Marker is at the intersection of 4th Street Southwest and O Street Southwest, on the right when traveling north on 4th Street Southwest. Touch for map. Marker is at or near this postal address: 395 O Street Southwest, Washington DC 20024, United States of America. Touch for directions. Other nearby markers. At least 8 other markers are within walking distance of this marker. Harbour Square (within shouting distance of this marker); Wheat Row (about 400 feet away, measured in a direct line); Military Education at Fort McNair (about 400 feet away); Lewis House (about 600 feet away); Barney House (about 600 feet away); Blending Old and New (about 600 feet away); Housing Reform and the Syphax School (about 700 feet away); Titanic Memorial (about 700 feet away). Touch for a list and map of all markers in Southwest. More. Search the internet for Linking the "Island" to the City. Credits. This page was last revised on March 18, 2019. This page originally submitted on July 3, 2010, by Craig Swain of Leesburg, Virginia. This page has been viewed 805 times since then and 10 times this year. Last updated on March 8, 2019, by Devry Becker Jones of Washington, District of Columbia. Photos: 1, 2, 3. submitted on July 3, 2010, by Craig Swain of Leesburg, Virginia. • Bill Pfingsten was the editor who published this page.